In this video, I’ve tuned both the Tecsun PL-880 and PL-660 to All India Radio on 9,445 kHz (transmitted from Bengaluru, India, some 8,800 miles away). I engage the PL-880 DNR feature in this video and compare with the PL-660 audio. Again, apologies for quality as this was made using my iPhone. 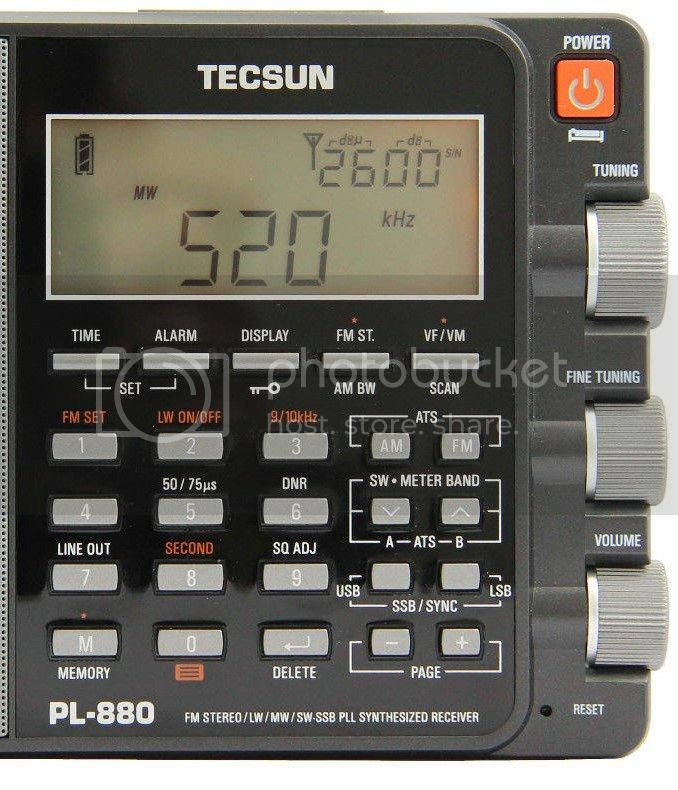 This entry was posted in New Products, News, Radios, Reviews, Shortwave Radio, Videos and tagged PL-880, Tecsun, Tecsun PL-880, Tecsun PL-880 AM Shortwave, Tecsun PL-880 Hidden Feature DNR, Tecsun PL-880 Videos, Tecsun PL-880 vs PL-660 on December 4, 2013 by Thomas. In my experience DNR is most definitely automatic receive bandwidth adjustment. It seems to follow an algorithm involving signal stregenth i.e the stronger the signal the wider the filter is and vise versa. Great information here and in the other sections of the ‘hidden’ features. The additional notations in the photograph are a very handy reference and I’ve printed the photo and added it to my user manual. Has anyone got to the bottom of what ‘DNR’ actually means and does on this radio? BTW, great music in the video above, from one of my favourite films. I forgot to mention, I actually verified using lab equipment that the sensitivity on the TS-830S that I compared to the PL-880 be better than 0.10uV for 10db S/N. I had a PL-660 and sold it on eBay. replaced it with the PL-880. It is well known and well documented that the BFO on the PL-660’s doesn’t work properly (or at the least it is very quirky). It would annoy me to no end when copying the mail listening to sideband or CW. I believe the 10 Hz and 50 Hz fine tuning increments on the PL-880 are incomparably better than the BFO on the PL-660. I have not noticed any problems with stability of the PL-880. I have two Kenwood TS-830’s (one gold edition). 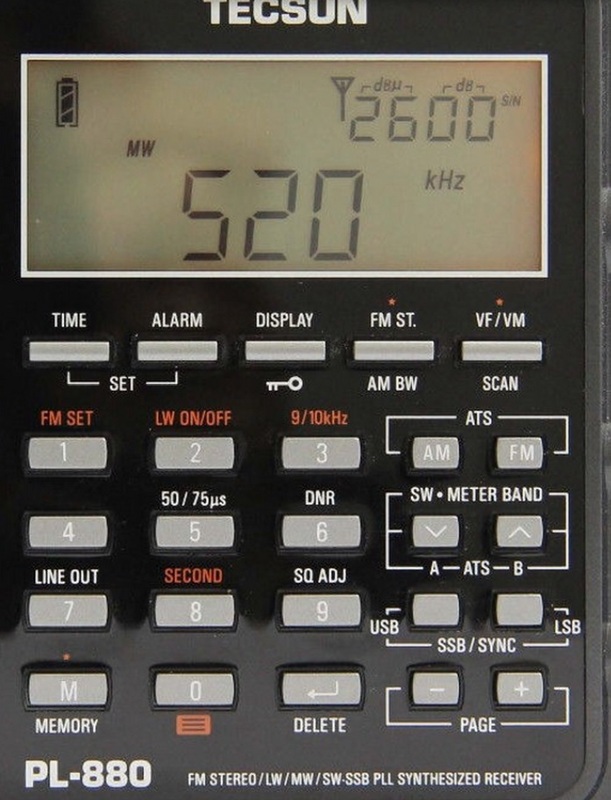 You may know that the TS-830S is one of the most sensitive (0.11 uV/10 dB S/N) with best noise figures ever made in amateur radio HF equipment. I can detect almost no difference between the sensitivity of the PL-880 and my TS-830S. Sensitivity was not a problem on the PL-660, however, selectivity was not the best. The variable bandwidth on the PL-880 provides a much better listening experience on crowded amateur bands than the PL-660. Also, the ability to turn on the display light and keep it on is very useful. Much better than the display light function on the PL-660. I rarely listen to anything other than amateur bands on the PL-880 so I can’t credibly comment on the other features comparison. I used the PL-660 synchronous detector a few times on weak shortwave broadcast stations. It seemed to me to make the signal easier to copy. By the time you add the cost of replacements for the poor quality rechargeable batteries included with the PL-660, the price difference between the two radio is less than $40. In my opinion, the PL-880 is easily worth the additional cost. From my point of view has this hidden feature nothing to with DNR, if you switch this feature “on”, you will observe, that it is an automatical bandwith-tool, switching automatically to a bandwitch, that is optimal for listening, often changing, while listening, when the signal-strength is changing. In this mode, you cannot switch the bandwith after your desire, but the machine will do this. For a stable bandwith, please swich this tool off by pressing the “6” some seconds. Another possibility for the “DNR” feature: different settings of maximum gain for the AGC. This would only affect the output of the weakest signals. Could the hidden DNR feature possibly be alternate stereo/mono thresholds and attack/release rates for FM signals? Maybe this is an FM DXing feature? You can hear a mono FM signal fine, while switching to stereo will give you a noisy signal. You need a stronger signal for stereo. This is why most or all stereo decoders have some switching, at a certain signal level, it will automatically switch away from stereo. The alternative is to blend things, I forget the exact details. The stereo spacing is not as strong, but the signal isn’t noisy. Some receivers have a variable blending of the stereo signal, none at all if the signal is strong enough, then quite a bit if the signal is weak, right down to now stereo if the signal is even weaker. That’s what is being described, a place in between full stereo and mono. I suspect that may be what is being talked about by “DNR” here, the “Adaptive noise suppression” mntioned in the datasheet sounds too much like “DNR” for there likely to be more than one feature in the radio along those lines. If that’s the case, then the DNR will only work on FM, because it’s only about FM. I’m not sure it’s really a DXing issue, if you are DXing you might as well just have mono reception. But it is certainly useful with car radios, where the signal levels can vary quite a bit, and the noisy stereo coming and going would likely be distracting. Same with portable operation, though you aren’t likely to move as fast. There used to be a commercial product for hifi labelled “DNR”. I can’t remember if it was specific to a company (or what company) or was licensed out. part of me thinks I had a car radio with DNR once. It stood for “Dynamic Noise Reduction” and the concept, as detailed in the hobby electronic magazines, was a voltage controlled low pass filter. When the volume was loud, the low pass filter was at some frequency out of range to affect things. As the audio level went down, the low pass filter would go lower in frequency. The idea was to wipe out the noise that’s there that would be blocked by higher levels of audio. And unlike some nose reduction schemes, it worked on any source, there didn’t need to be an encoder like for Dolby. I have no idea if this “DNR” is that sort of thing. that dnr was called Dolby noise reduction. I suggest you try DNR usabiligy on weak LW/MM/SW and strong LM/MW/SW signal. The same applies to SSB and CW signal. Thanks your effort! BTW, could you try the tone(bass/treble) usability for decoding marginal signal ? Last adjacent interference 10kHz away trial was just based on BW and SYC functions. It seems DNR unusable in AM mode, how about try SSB or CW signal ? And 50/75us should be FM deemphasis, the setting was shown on ATS-909X mod listing. I should know soon, though. Check back. I greatly appreciate all your postings. They are filled with valuable information. I should be getting my PL-880 tomorrow according to UPS. Interesting, in the picture there are some extra notations above some of the keys such as the DNR and above the 5 key is 50/75 us. I wonder what that key (5) does? These don’t appear to be in your video and they are not in the manual (website pdf).